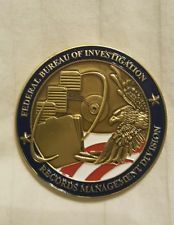 An actual physical copy of the FBI's Records Management Division challenge coin. A photo of said coin is attached. To be clear, I am interested in obtaining the coin itself as a public record, similar to a reproduction of a photograph. I am willing to pay all associated reproduction fees, up to $40. This was a reasonably described, nonexempt record. At the bare minimum, please provide justification for why a reproduction of the coin is any different than a reproduction of a photograph, rather than simply stating that my request "doesn't comply with FOIA." DOJ-AP-2018-005428 has been processed with the following final disposition: Affirmed on Appeal -- Records not reasonably described.